For general enquiries during your visit, or for more information on what our Museum can offer, visit the friendly staff at the Welcome Desk, located in the Atrium, next to the main entrance. Please wear suitable footwear in the Museum. All our staff are first aid trained and are authorised to operate the AED (automated external defibrillator) which is located by the sliding doors on the ground floor near the main entrance of the Museum. Please contact us to discuss how we can assist you further with your visit. The Air Force Museum is the perfect place for families to spend an hour or an afternoon, with plenty to engage both children and adults. We have a kids’ play area located on the first floor, where you can try on an Air Force uniform jacket, colour in an airplane picture, take an aeroplane ride (coin-operated), or simply relax in the sun! 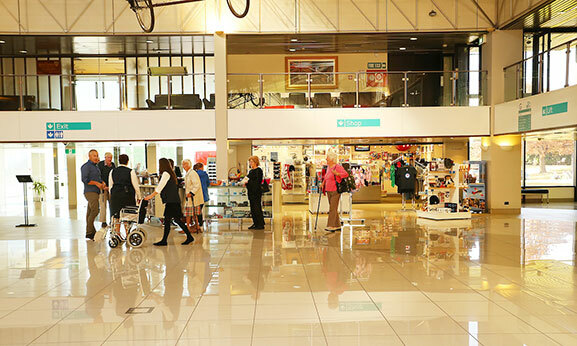 The Museum gift shop, located in the Atrium next to the Welcome Desk, is well-stocked with a variety of unique aviation-themed gifts and souvenirs for all ages. Come in and visit us, or shop online. All proceeds from shop sales help support our mission to preserve and share New Zealand's military aviation history. Contact Café, located in the Atrium, provides great coffee with a daily selection of fresh cabinet food and a bistro menu. Offering free Wi-Fi and an array of comfortable spaces, including plenty of space for prams and wheelchairs, the Café is ideal for a relaxing break during your Museum visit, business lunches, ‘mums and bubs’ coffee groups or just a social catch-up. Open 9.30am to 4.30pm daily. We have an extensive research collection and welcome enquiries. Visit our Research page for more information.